Football is obviously a dangerous sport, writes the Atlantic's senior editor Ta-Nehisi Coates, but NFL fans and executives must be honest and open about that fact. Coates, who declared earlier this week that he could no longer support a sport that inflicts such injury on its players, added in a new column that those who speak out against football's dangers should not be shunned by others involved in the sport. Instead, their comments should be addressed directly with safety-procedural changes. There's a kind of blindness at work … This is a sort of denial-ism wherein "I respect your opinion but will do something else" is taken as an existential threat. Meanwhile the actual existential threat is is dismissed as a non-problem that will be fixed by fines and better helmets. I don't think these guys get it at all. Or perhaps they do. I have a certain respect for someone saying "I go into this fully knowing the risks and contradictions but will do it anyway." But that's not what we're getting. We're getting the risks are overblown and the mildest talk of them is "unacceptable" and "trashing the game." MORE: I'd like to add one other point. 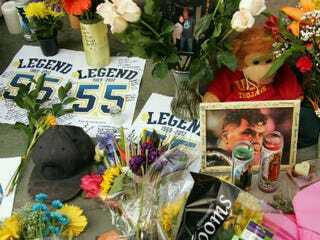 Junior Seau's family agreed to have his brain studied. It may well turn out that brain trauma had zero to do with his death. That doesn't affect my own personal decision one bit. As I said before I've been debating this for years now. I can't really live in the space of wondering whether the game I support killed him. I'm a firm believer that very need to ask certain questions is a sign, regardless of the answers. Read more of Ta-Nehisi Coates' column at the Atlantic.